Celebrating the life of Frederick Goodseal, Jr.
Obituary for Frederick Goodseal, Jr.
Frederick Eugene Goodseal, Jr. (Freddie) was born March 26, 1963 to Frederick Goodseal, Sr. and Wilma Patricia Roberts-Goodseal in Kansas City, Missouri. Do to family dynamics, Freddie moved to Denver, Colorado to be raised by his grandparents Curtis and Margaret Goodseal. Curtis called home shortly after Freddie's arrival and Margaret, who Freddie affectionately called Mom, became just that to Freddie. Freddie was baptized by the late Reverent Wendell T. Liggins at Zion Baptist Church when he was seven years old. Freddie would treat everyone he met as a life long friend. If you were blessed to know Freddie for than a day, you became family. He is known as "Uncle Freddie" to most of the Zion congregation. 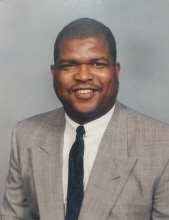 As a part of the Trustee Ministry, Freddie used his talent as a Financial Manager to help Zion be good stewards of the tithes and offerings given to the church. Freddie was educated in the Denver Public Schools system at Columbine and Barrett Elementary, Kunsmiller Jr. High, and Denver South High School. Freddie developed a love for music and played Tenor and Baritone Saxophone in the Jazz and Concert bands. Freddie was a proud South Rebel at South, he was a starting tackle, playing both offense and defense. He was known for wearing all white from head to toe and liked to finish a game as clean as he was when he started it. Freddie earned a football scholarship to Langston University and returned home after two months of playing football in Oklahoma stating "I couldn't keep the red dirt off my socks, so Oklahoma is not for me." He continued his education at the University of Northern Colorado studying finance and making more lifelong friends. During Freddie's early years, he was a member of the Highlanders and the Boy Scouts where he developed a sense of duty and community. Later, Freddie would become an ardent sports fan and loved the Dallas Cowboys. He and his friends would spend hours in the basement, , painting players in their favorite sports team's colors and playing Electric Football. Freddie did turn from the dark side and became a Denver Broncos fan during the Broncos' 1977 run to the Super Bowl that ended with the Cowboys defeating the Broncos. Once he was able to drive his Powder Blue Chevy Nova II, he traded in the electric football to play football and basketball in the parks with his brothers or hanging out at Celebrity Sports Center bowling, playing video games, or just for a plate of fries. Freddie was an entrepreneur at heart and over the years many business ideas crossed his mind including Arian Enterprises and more recently, Goodies Fun Emporium. During his career, Freddie was a salesman for several companies until he discovered the financial services industry and spent a bulk of his career as an independent financial consultant. Freddie married the love of his life Valerie D. Collier Goodseal April 25, 1992, and they created a loving family helping raise their nephews and niece; their home is where they always wanted to be. Freddie was preceded in death by his father Frederick Sr. and his grandparents Curtis and Margaret. Freddie leaves to cherish his memory, his loving wife Valerie, his mother Wilma Patricia, his siblings, many aunts, uncles, nieces, nephews, and friends. To send flowers or a remembrance gift to the family of Frederick Goodseal, Jr., please visit our Tribute Store. "Email Address" would like to share the life celebration of Frederick Goodseal, Jr.. Click on the "link" to go to share a favorite memory or leave a condolence message for the family.